Connolly’s RED MILLS is the feed of champions, and it is trusted by leading owners and trainers worldwide. Our recipes are fully transparent and traceable, made from locally sourced ingredients, and farmed by people we know and trust. The finest of fresh natural ingredients to create balanced animal feeds, developed with your profit in mind. Preparation is key to success when it comes to the foaling season, whether you have 1 mare to foal or 50, there are some basic elements that should be included in your foaling kit. Having a foaling kit prepared in advance will avoid panic, and provide piece of mind. Your kit should include standard items needed for the foaling process, and those that may be needed in case of emergency. Like anything with horses expect the unexpected. 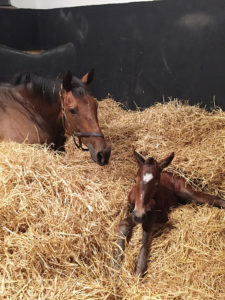 Whether you chose to allow your mare to foal out, or in a confined space such as a suitably bedded foaling box, good management and monitoring is vital. An important consideration for your pregnant mare is to ensure that both vaccines and the de-worming programme are up to date. If your mare has had a Caslick’s procedure the suture line should be opened by your vet prior to your mare’s due date. Normal gestation for a mare is between 320 and 365 days, with the average being 341. It is imperative that on approach of the due date regular observation of the mare is carried out, to monitor for any physical changes that may indicate an imminent foaling. Labour consists of 3 stages, it is important to familiarise yourself with these stages, and the accompanying problems which may arise. Torch & batteries You never know when the power could go! We hope these tips and tricks for creating your foaling kit were useful. Best of luck for the 2019 foaling season, and we look forward to seeing photos of all the new additions. *Always consult with your veterinary surgeon should you have any queries, or concerns regarding your in-foal mare or foaling. Starch – Good or Bad? What should I feed my horse during travel or quarantine? How do I introduce a new feed into my horses diet?